Today marks the end of Alte Försterei redevelopment, that began in 2008. New main grandstand was traditionally partly built by fans, of whom some 150 took care of installing seats voluntarily. This allowed for the structure to be ready for today’s encounter against Sandhausen. Thanks to this addition to the stadium, clubs finances are expected to get a boost, though the budget has been growing constantly – 50% since 2009. Now not only 3,617 new seats were added, but of them 1,700 are business ones, not mentioning 30 skyboxes that became the most expensive spots at the “Old Forester”. This made Berliner Zeitung ask, whether Union wouldn’t lose some of its unique atmosphere of equality of all members (currently a massive 11,000 fans are shareholders) and coziness at the stadium? President Dirk Zingler doesn’t think a threat like this exists. 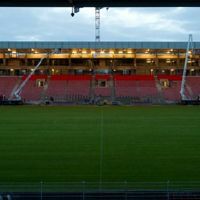 In his opinion, the club has now reached the level it aspired to and excessive commercialization isn’t happening – size of the new grandstand has been chosen consciously.